This week is among my favorite weeks of spring baseball. There are 150 players at the Carpenter Complex. Thirty-plus on each of four fields. More than enough action to satiate anyone’s thirst for baseball. Young baseball. Baseball played by players too young to know their chances are long at making a major league roster. The youngest players in camp are teenagers Lenin Rodriguez (17) and Jhailyn Ortiz. And, players trying to extend their dream for one more season. The oldest player in camp is Jake Fox at 33. And, really, watching batting practice off coaches doesn’t excite me any more. And infield drills can get monotonous. Luckily, today’s workouts were brightened up with news that a group of GCL-level players and 4 pitchers from the Phillies’ camp were going to play a game against a Japanese college team. So when the players broke for lunch, I did, too. And hurried back for the game. Before lunch, I watched three batting groups on different fields. I always search out “C” Randolph. I enjoy watching him bat more than any other player in camp. I am so thankful that he has lived up to the hype for which I was responsible. My credibility remains intact. Still, you should question me when reports on Randolph sound too good to be true. I admit I am a fan. Keep me honest. Today he sprayed line drives around the field. Again. He is as flawless in the box as I first reported last summer. If he grows into some home run power, watch out. Jose Pujols was in his group. I am still waiting to see the batting practice home run power I read about in Williamsport last season. I am a doubter. I need to be convinced. Andrew Pullin, Jesse Valentin, and Tommy Joseph made up a group on a back field. I went there to see Aaron Brown and Dylan Cozens, but they took their swings while I watching Randolph. Pullin and Valentin were interesting to watch. But, I can’t help but feel that Joseph is playing out his string. His future seems to be in the hands of others. Their springs may dictate what happens to him. The third group I watched included Carlos Tocci, Cord Sandberg, and Herlis Rodriguez (H-Rod). Tocci makes some contact, but his “power alley” is the 18 inches on either side of the third base line. As his hits move further into the field, his power diminishes. Sandberg is an enigma to me. He looks like he should have extensive power. I rarely get to see it. I see a smart, in game player. I hope to see him everyday in Clearwater’s outfield this season. H-Rod is another of my favorite players, but I haven’t felt the need to get effusive about his skills. He moves the ball around and has pull-power to right. I arrived at Bright House Field to discover that a GCL-level team meant a mostly LA line up from Groups 2, 3, and 4 with Mitch Walding, Brendon Hayden, and Edgar Cabral. The first four pitchers were David Buchanan, Edward Mujica, James Russell, and Luis Garcia. Matt Hockenberry rounded out the pitching staff. Cody Forsythe and another pitcher were in the bullpen if needed. They completed their daily pitching sessions in the ‘pen while Hockenberry closed out the game. The Phillies fell behind in the second. Buchanan was charged with 2 unearned runs on throwing errors by Canelo and Luis. Canelo threw poorly to first to allow a base runner who scored later on a single to left. Luis prevented runners from moving up with an on target throw to the cutoff man. On the next play, he air-mailed his throw to the cutoff reaching the backstop and allowing a run to score on a play where the Japanese weren’t going to test his arm. Walding got one run back in the bottom of the inning with a towering blast to right. In the third, Grullon’s two-run blast to left scored H-Rod who had grounded a double down the left field line. 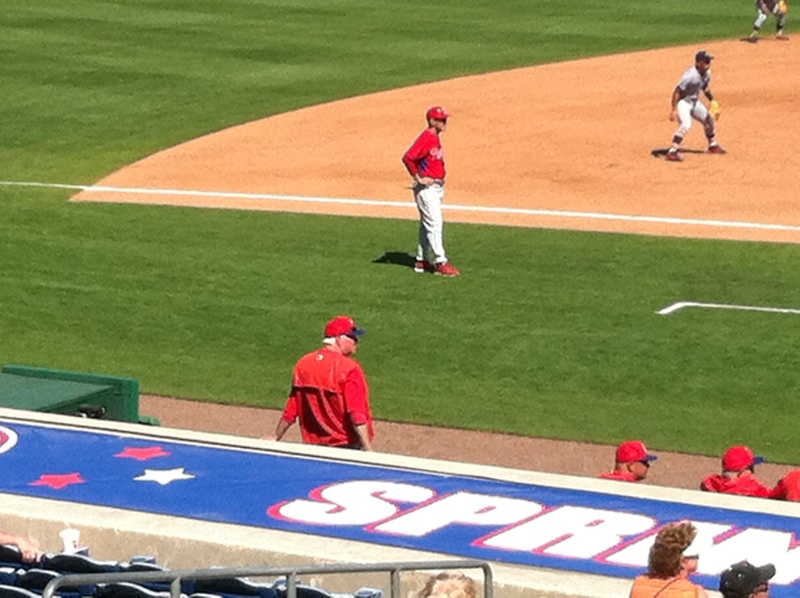 Charlie Manuel in a new role as back up third base coach during the early innings of today’s game. I guess the Phillies didn’t get the memo that Ortiz can’t play the outfield. The Phillies tacked on a run in the sixth when a run scored on a throwing error on a double play attempt. Meanwhile, the pitchers kept the Japanese off the board and turned a 4-2 lead over to Hockenberry to start the ninth. He allowed a HR on his first pitch and later the tying run reached second on a passed ball. But the Phillies held on to win 4-3. All of the Japanese left-handed batters swing like Ichiro. One of the hits off Russell was lost in the sun by Rodriguez. The other was launched over a too shallow Ortiz in right. After the inning, the youngster was coached up by Coach Delima. He was deeper the remainder of the game. He made a nice play cutting off aball in the gap and holding the batter to a single later in the game. Note: all the Phillies outfielders were playing the Japanese shallow most of the game. They made situational adjustments sent in by the coaches after they built the two-run lead. Hockenberry’s fastball must have looked like a snail to the japanese after facing Garcia’s heat. The Phillies had 10 base runners on 6 hits, 3 BB, and a throwing error. Ortiz fell quickly behind 0-2 and laid off some close pitches to come back and earn the walk. He has remarkable composure behind in the count for a young man. I can almost smell the popcorn and taste the hot dogs. I think I’ll get a cold beer from the fridge… wait… it’s 6am. Ahh hell, it’s 11:00 somewhere in the world. Jim – may I suggest roller blades to expedite your trips between fields. Ortiz still moves fairly well but he carries much of his size in his lower body. He was listed at 6-2 when he signed last July, but he looks at least two inches taller (Jim – not sure if you can confirm that). Still, if the bat plays with power, I’d hardly complain if his future is destined for first base. His position is much less of a concern to me than his bat. Commenters making absolute declarations like “Jhailyn Ortiz can’t play outfield” without having ever seen this 17 year old kid play is the most annoying thing to me on this board. There’s so many absolute, drop dead statements made about these 17-21 year old kids, like there’s no room for improvement, advancement or broadening of skills. And the crazy thing is 99% of the people on here have never seen 99% of these kids play. While I’m listing my grievances haha, the lack of awareness regarding the importance of age to level for a prospect is also frustrating sometimes. When a 25 year old first baseman REPEATING double-A has an ok season let’s keep that in context. That doesn’t make him the next Phillies first baseman….it makes him a 26 year old that has to prove it again in AAA and then POSSIBLY be a bench bat for a few years in the majors. POSSIBLY. Commenters going overboard when they don’t agree with another’s opinion is the most annoying thing to me on this board. Sometimes the keys we press on our keyboards do not manifest into a perfect representation of one’s thoughts. For instance, when I posted that Ortiz can’t play outfield, the implication was that Ortiz will not stick in the outfield, even if the short term plan says otherwise. I’m not wrong in this regard merely because he played outfield in yesterday’s scrimmage. And I wasn’t making an absolute declaration anyway – merely expressing an opinion. I actually wasn’t even referring to your above post. It hadn’t posted yet before I wrote mine. I was referring to other comments I had read on the previous post. I thought you had quoted me verbatim from the General Discussion thread where I recently posted “Ortiz has zero chance of playing the OF”. Even now as I revisit it does read quite matter-of-factly. Wasn’t my intention even if I am confident that he’ll move to 1B in the not to distant future. If I’m proven wrong, that would be good news for the franchise (and for me). I recognize more names here than at BrightHouse! We should have taken a ride up. Do you think all the lefty Japanese players learn from the same coach? Thanks for the post. Sorry. I thought about starting the phone tree to all you locals, but not until was eating lunch at Legends. By then I thought it was too late. Jim, great work. Thanks. It must have been a great surprise day for you. Interesting to me for HR to play CF with Luis in LF. HR could be something if he can play CF, not so much as a corner. Also, Grullon showing power is a great thing. Does he look stronger? His arm is a thing of beauty, if he can just hit a bit more our catching depth would become even better. I don’t want to pile onto Stassi here because he is a very good fielder, but I caught an inning or two of the Phillies on TV this weekend and one play that caught my attention was Crawford making a nice back handed play and throwing low across the infield. It wasn’t a short-hop, it was more like 5-10 feet from first base when it hit the ground and came to Stassi at first about knee high and he totally missed it. It hit the runner in the leg which kept it in the infield (and confused Stassi because he didn’t get his glove on it then turned around turns the stands and couldn’t locate the ball). I just thought it was strange because he just totally missed it and I haven’t heard anything about it since, but I’ve seen a few articles touting his defense this spring (which is well-deserved, he is a very good defensive player at 1B). That quote was actually what prompted me to write the above post. I read Mackanin’s quote and immediately thought about the play mentioned above and realized no one ever mentioned it. It was just ugly that’s all. Like I said above though, Stassi is a good fielder in general. During the 1st week of Spring Training don’t most pitchers just work on locating fastballs? Why get worked up over AA players who got some hits off pitchers trying to get stretched out? These guys still have to go to AAA and do something. Heck, Cedric Hunter, a CF, has had 2 or 3 seasons in AA that were better than Stassi’s 2015 and Hunter hasn’t received a sniff. Stassi still has some work to do. I don’t understand the need to minimize Stassi’s 2015 season. He won the MVP on merit and got every big hit for the team down the stretch. He is older obviously and in the middle of his prime years. I don’t think anyone is saying he’s going to be a major league starter but he’s looked very good in spring training and everyone has taken notice. If Howard gets hurt during the season, or released or traded late in the year, I could see Stassi getting the call if he has another good year at AAA. Pointing out that Cedric Hunter has had multiple AA seasons better than Brock Stassis’ 2nd try at the level, is not minimizing his season. It’s putting the season in its proper perspective. An .850 OPS in Double A, from a 25 year old 1st baseman, is not special or impressive. That’s all. also don’t forget Brock’s success was the result of a swing change. He changed his swing to be like Josh Donaldson’s, so its not like he had a lucky season or was better because he was older. you can go on youtube and look at the difference in swings year over year from 2014 to 2015. the most noticeable thing is the much bigger leg kick. I have seen Rodriguez in CF at the Complex over the past 3 seasons. He is capable at all three OF positions, although I’ve seen him mostly in RF. And those appearances must have been during XST, since he hasn’t played there much during his GCL seasons. If Herlis can play a legit CF, he has a chance to make the Show. His bat will carry a CF. I like watching the guy play myself. I follow a bunch of GCL scouts on Twitter. They are just as high on C as you are. I am as well. good to see Morgan throwing his FB consistently at 91-93 and topping 94 multiple times and adding cutter in the high 80s. Morgan hit 93 and 94 2 to 3 times in the 2nd inning. so far, the battle for the 5th starter is looking good and the depth that comes with it. the bullpen guys are looking solid too in number of games now. It’s only spring training, but at least the Phils are now looking sixers-like awful like what most of the experts are saying they will be. Wow, that’s a good sign. I hope he can keep that velocity up.